← Improving the Claires Court newsfeed for 2014 – paper v web! During our working lives at Claires Court, we plan a very good deal, check across the piece that the opportunities arising are fairly shared, and reflect yet further after the event to ‘mop up’ where needs be. Serendipity however has its part to play, and last week included more than one such luck break. I would like to thank you once again for a fantastic reception and visit at your school. Everyone who participated was really stunned by the hospitality and kindness from staff and students. It has been very inspiring for the Swedish delegation to visit your school and understand how you work with Google apps, Samsung Chromebooks and ICT overall at your school. The school environment and surrounding’s was something that really impressed the delegation, alongside with the very polite and engaged students. The feeling of being in someone’s home instead of in a traditional school environment was a comment that came out several times. Being toured around by the students, having the chance to talk to both them and other teachers was something that was highly appreciated. We hope we get a chance to visit you again in the future. 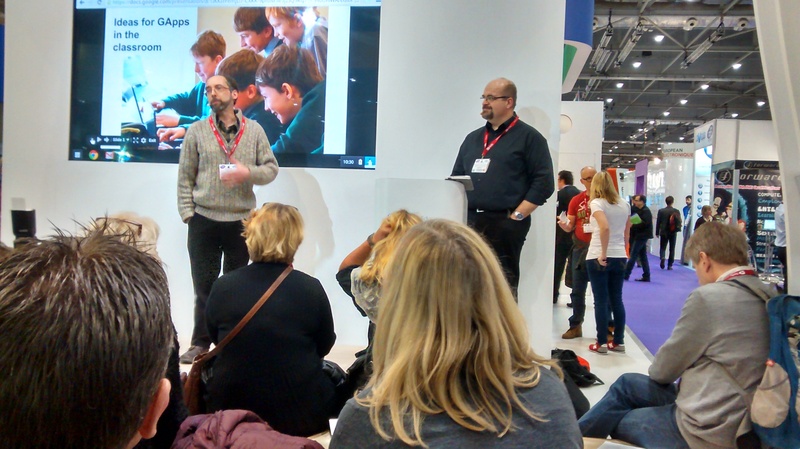 Regular readers of this Blog know we are working closely with Google and Samsung, and so it was perhaps no surprise that both corporations were keen to invite us to speak from their stands at BETT, to share our experiences and expertise with others planning a similar educational journey. Chris Rowan and Eric Leuzinger spoke on Friday morning, 10.30 am, on the best of Junior boys practice, spotlighting the Weblog and wowing the large audience quite considerably. Paul Robson spoke from the stand at 1pm, sharing some of his huge expertise on managing such an amazing roll out as ours, explaining what’s hot and what’s not and in every other way highlighting the very best of what can be done. I spoke with 2 younger students, Joe and Barnaby, from the Samsung stand on Friday noon, and at Google on Saturday noon – here is our presentation. These various talks seemed to do 3 things: build further on our reputation for caring and sharing, building a body of professional knowledge and experiences for others to work with and connect; link us with new friends and acquaintances with their own talents and interests, keen to sweep us up into a bigger mainstream of ‘flow’; excite us as practitioners, renewing our interests and passions for our own colleagues back home. It was most notable that the main entrance to BETT 2014 was dominated by the Samsung stand. They had areas for lectures, for using their Chromebooks and tablets, to study their services and to test out other initiatives and technologies that are coming in to the Classroom. Their front door was formed by a mammoth video wall, and guess what – pictures of Claires Court pupils and staff featured all over the display. Respect, Samsung and thank you for the recognition. The pictures came from the video they made here last summer, and included stills from the other 2 institutions they included in that work last year. I found the whole week quite moving. For such serious players from Sweden, for example the team leading digital learning in Sweden’s 3rd City, Malmo, to be so very impressed by what we are doing was indeed gratifying. But more than that, they were blown away by the hospitality our children offered, by both their friendship and quality as communicators. They admired our teachers ability to make demands of our children in just the right way; tough enough to get output, wise enough to ensure choice and diversity was possible. And we have been offered many opportunities to engage further, which is nice, and we’ll be thinking that through over the next few days and weeks. You can read our news thread here. I guess that the Irish saying covers our work last week quite well. Nothing really happened, we didn’t invent anything new, and this week we are back at the ranch, cutting and mowing as normal. But we did really live our values last week, we stood up and were counted when our friends asked. We know this week that we have rather more friends in the world community, ones who recognise that we are worth the journey for refreshment and conversation. Oh, and for some very serious learning opportunities too. This entry was posted in Uncategorized and tagged claires court, Google, Joakim Abrahamsson, Samsung, Sweden. Bookmark the permalink.